Hampton Yacht Shipyards are well known and highly regarded for the "overbuilt" construction of the company's motor yachts. 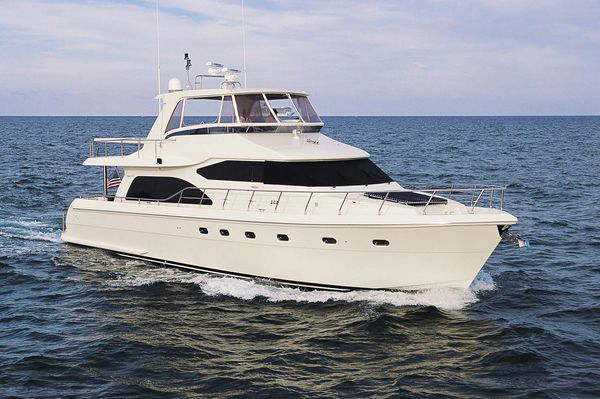 The Hampton 680 hull design produces a smooth and very solid ride and good range with 1,500 gallons of fuel. The high standards of craftsmanship and fit and finish are evident throughout this Hampton Yacht, and "Papagei II" is an excellent example of this shipyard's workmanship. The H680 has many desirable features that make this model very attractive to the serious cruiser. First of all, the strength and quality of the hull is what a serious cruiser would want in an offshore capable cruising yacht. The speeds attained by the dependable Caterpillar C18's are impressive and the economy of operation is also. The relatively shallow draft is advantageous and the low maintenance materials used in the yacht's exterior construction also go a long way towards keeping the fun and enjoyment in boating by reducing the amount of work required in upkeep. The layout is great and most accommodating with a terrific flybridge, galley-up, 3 staterooms, 3 heads, plus a private and separate stateroom with a private head and shower for a captain or mate. Really a terrific yacht in great condition, offered at a realistic price and actually at a great value. A rare offering. See more Hampton Yachts listings on the Hampton Yachts page.